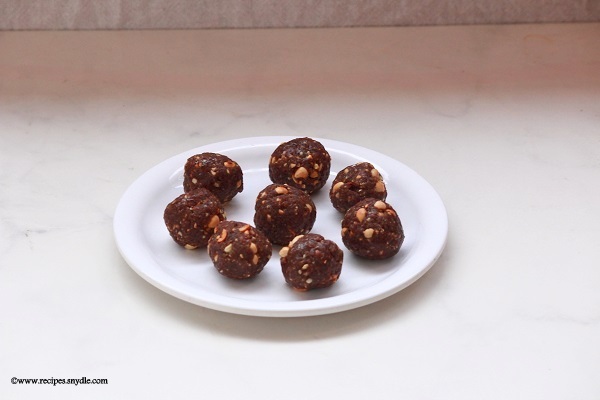 Ragi ladoo is a tasty ladoo made with ragi flour. It is very easy to make and healthy. 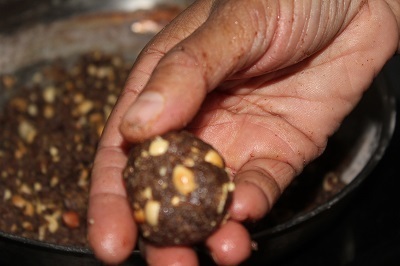 This ladoo is made with jaggery. Ragi is very much used in South India to make ragi roti, idiyappam, dosa, and even cookies. Many people don’t like the taste of ragi. I have seen many of my relatives using sugar while making these ladoos. To make it healthier, I have used jaggery here instead of sugar. 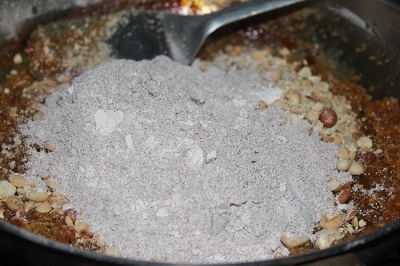 This recipe uses ragi flour, jaggery, coconut, peanuts as the main ingredients. This is my mother’s recipe and we made it recently when she visited us. Ragi with jaggery is a great combination and I love this ladoo. I have used peanuts here, but you can also use all kinds of nuts available with you. Ragi is also called as finger millet and is reddish in color. 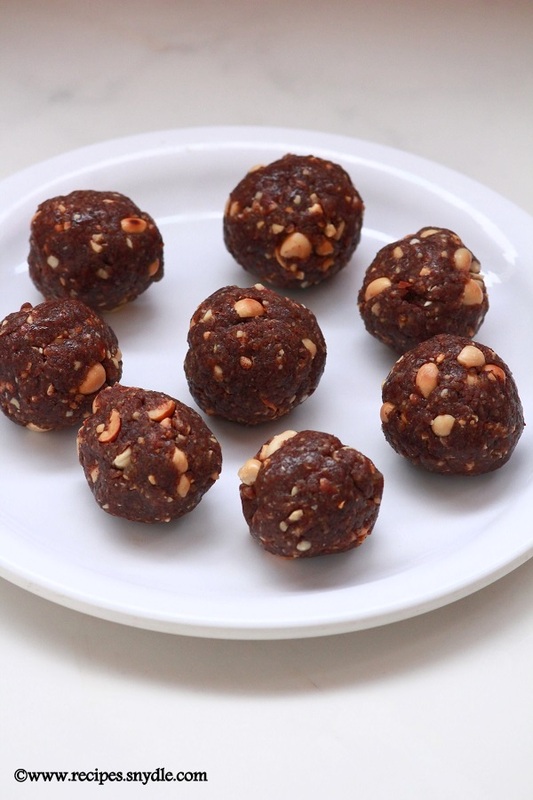 Ragi ladoo is very nutritious and healthy. This ladoo does not contain too much of ghee or oil and hence is very healthy. Here in this recipe, I have used homemade ragi flour, but you can also use store bought ragi flour. Sometimes, my mom makes this ladoo using sprouted ragi flour also. It is also very tasty. 1. Add ragi flour to a pan and dry roast it in low flame till you get a nice aroma. Take care that ragi flour should not get burnt. Transfer it to another plate and keep it aside. 2. 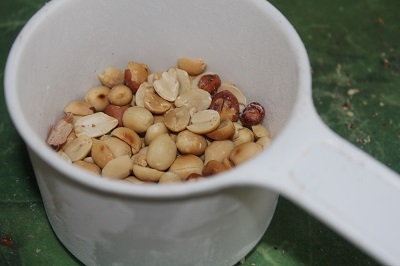 In the same pan, add peanuts and dry roast it lightly in low flame. Keep it aside. Let it cool. Then rub it within your palms and remove the skin. 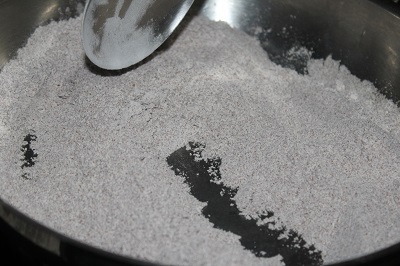 Then grind it to a coarse powder. 3. 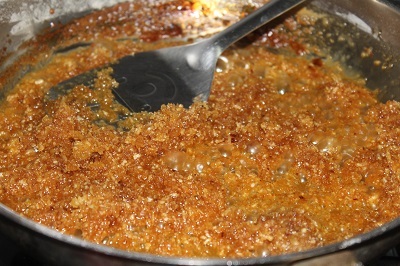 In the same pan, add jaggery and 3 tablespoons of water. Wait till the jaggery get melted. Then strain it using a strainer to remove all the impurities. 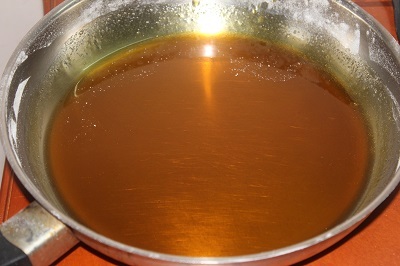 Add 1 tablespoon of ghee to the syrup. Boil the syrup on low flame till it reaches a soft ball consistency. To check this, keep a small bowl filled with water. Add a drop of syrup into the water. Take it out and try to roll it. You will be able to roll it into a ball. This is the right consistency. 4. In the same pan add the scraped coconut, mix well, and bring it to a boil. Once the coconut get mixed well, turn off the flame. Don’t wait till the entire moisture goes off. You can mix the coconut along with the ragi flour also. 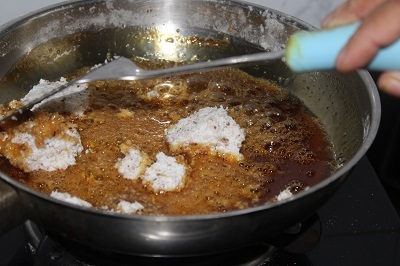 But adding the coconut to the jaggery syrup increases the shelf life. 5. 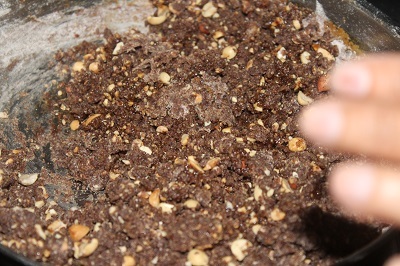 To this add crushed nuts, roasted ragi flour, cardamom powder and mix well. You have to mix everything quickly. Make sure that there are no lumps. 6. Grease your palms with ghee. Take small portions of the dough, and roll it into balls. If you are not able to roll it properly, then moisten your palms with milk or water or ghee, and then roll it. 7. Ragi ladoo is ready to serve. Previous Post: Sheer Khurma Recipe. 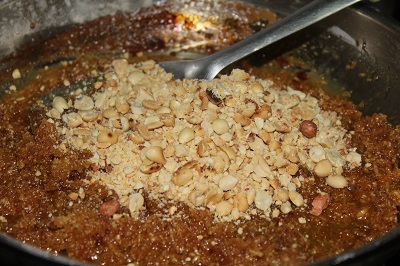 Next Post: Thekua Recipe/Khajoor Recipe/Meethe Khastte Recipe.